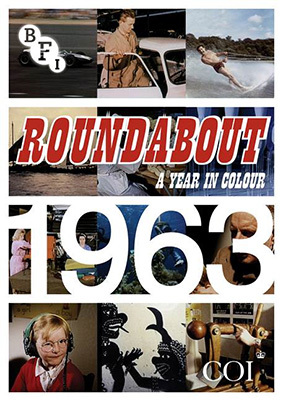 Roundabout: 1963 - A Year in Colour is the first in a new series of previously unreleased 'cine-magazine' films from exactly 50 years ago, which will be released on DVD by the BFI on 25th March 2013 at the RRP of £19.99. In the 1960s, the British Government, through the Central Office of Information (COl), produced a range of topical films about Britain for distribution throughout the commonwealth. Roundabout was one of the most popular of these cine-magazines. The BFI has collected together all the episodes of Roundabout produced during 1963 enabling viewers to travel back in time to see Britain and its place in the world – in particular its manufacturing partnerships with Commonwealth counties – 50 years ago. Designed to promote British industry and values abroad, Roundabout's colourful selection of topical stories – each episode featured three or four different subjects – was particularly aimed at the Asian market. To show the connections between the Commonwealth countries and Britain, many of the films illustrate how raw materials from one country, such as rubber, palm kernels, wood or cocoa, were used in manufacturing industries in the UK. Highlights amongst the 11 globe-trotting films on this disc include a visit to the Royal Mint, trips around factories making the Mini car, cigarettes, sweets and books; a tour of a rubber tree plantation in South East Asia and a look at modem architecture in London, Djakarta and Saigon. There is a story on the then new activity of skin diving, the versatile British jet boat and the building of a new stand for racing at Ascot. This set also includes an illustrated booklet with film notes and an essay about cine­ magazines written by expert Linda Kaye of the British Universities Film and Video Council. All the films in the Roundabout series are now preserved in the BFI National Archive.